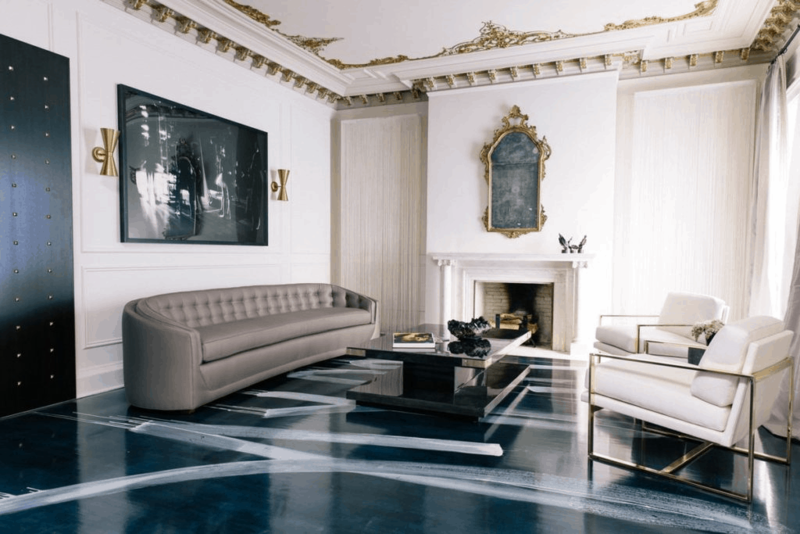 Whether you’re rearranging the furniture in your living room or embarking on a major interior upgrade, these details can have a serious impact on the moves you make in a space. 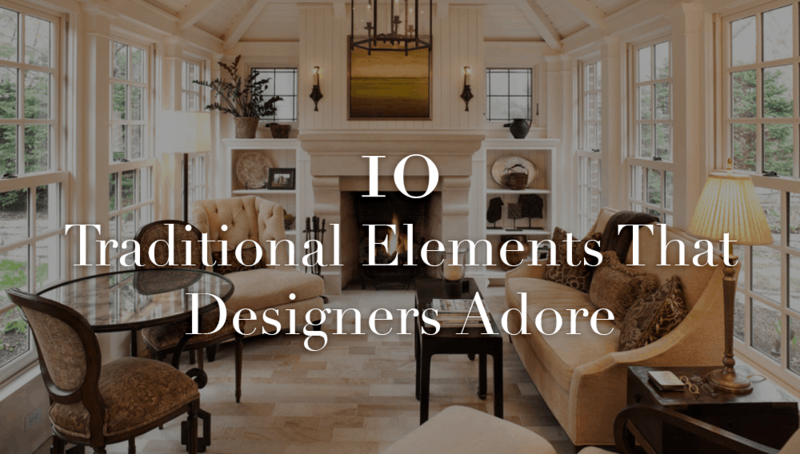 After all, it’s often the “pesky” column, ornate molding, Georgian mantel or another quirky detail that gives a home its character. Round windows are a surprising and dynamic element that takes the room away from the predictable decor into a soft, fluid area where round shapes are contributing to the diversity among the windows of the house. They have a historic appeal that works with vintage elements. There is nothing more stunning than a rich, ark, wide-plank wood floor that makes your jaw drop when you walk into a room, and there are many ways to create this look. Dark wood flooring can be created using a variety of wood styles and finishes. The most natural way is to use a naturally dark wood like Walnut flooring. However, to achieve the same look designers are often using engineered wood flooring for its durability, as well as cost-effectiveness. Balance is key. We start with the space itself and try to make the strong architectural details not be the only important element, so the space does not feel lopsided. As with everything in design, and maybe in life, it all boils down to balance! In this design patterned tiles and textural wall coverings are used to offset the detailed molding, coffered ceilings and stunning archways. This is the perfect example of the use of contrasting modern finishes with stately, permanent elements. 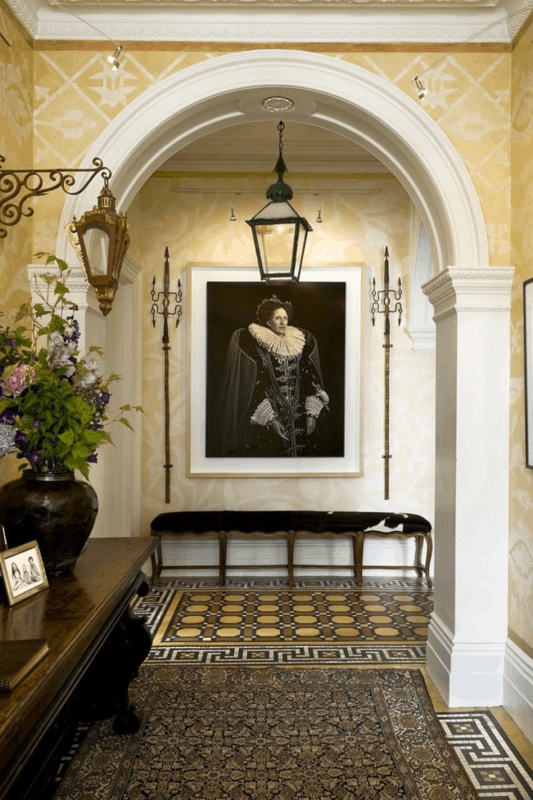 It can be a challenge to design a room around such a classical and stately details as gold-gilded ceilings, while still making the space feel fresh and modern. It can be done! 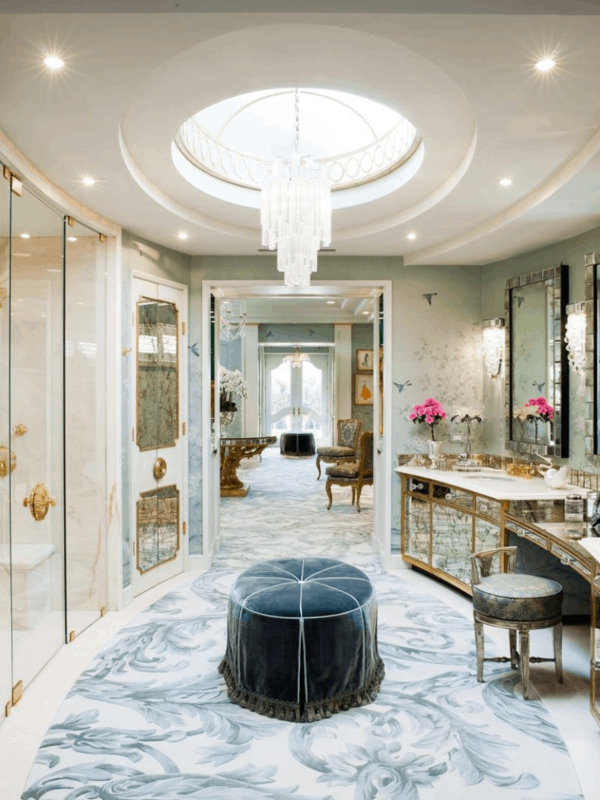 In this highly-ornate oval room, a custom-designed oval skylight filters in natural light and creates the perfect ambience for applying beauty products. To add further to the elegant nature of the room, the skylight’s frame is finished with antique silver and 22-karat gold. There’s something about a home with french doors that just make a space seem so airy and bright. And, the best part of this feature is they provide the best of both worlds: They offer some privacy and noise-control when needed but can also make interiors seem large and open when they’re left ajar. French doors are also classically gorgeous and seem to work flawlessly in any space — even the bathroom. Not much contends with a fireplace in its capacity to anchor a room and to define an aesthetic. The decision to incorporate a period fireplace rather than commissioning a sleek, contemporary one can make or break a space. In a room with a fireplace, the entire space is organized around this luxurious feature, so it is very crucial to find the right one with the right style, right condition and right measurements. 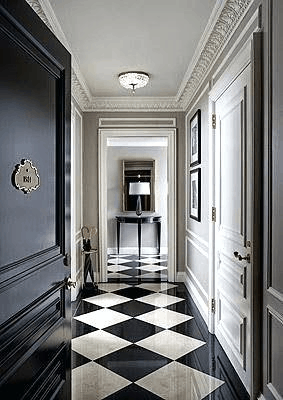 Black and white chequerboard flooring has been a popular look since Victorian times and there are many ways of recreating that look. The classic mix of Italian white Carrara marble and black Nero Marquinia marble (limestone, actually but it is often thought of as a marble) has always been and continues to be popular. It gives off an heir of grandeur in the right application. We are so enamored with the beauty of crystal chandeliers we tend to forget that the dazzling shine and light reflecting qualities originally were used to enhance and distribute the soft light of the candles that once were used as the light source. Those crystals that we love to see sparkle served as a utilitarian purpose. 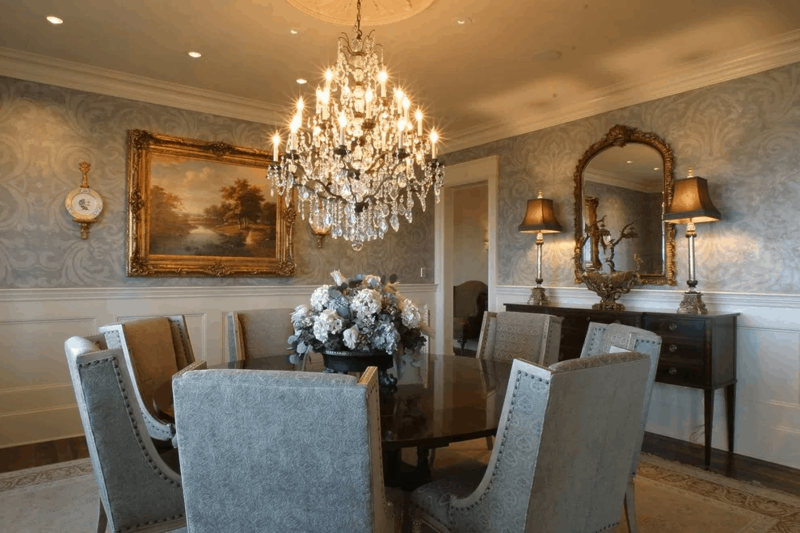 We believe placing a crystal chandelier in any room can turn it into a breathtaking space. In the powder room, entryway, or in your romantic bedroom or dressing room, the delicate nature of a crystal chandelier adds a bit of romance to your life. 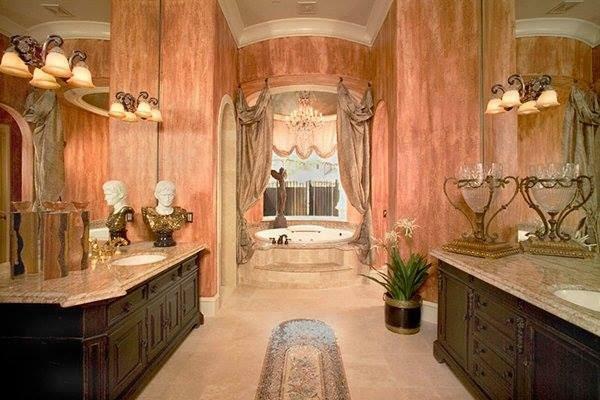 Custom faux wall finishes add that extra hint of drama to any room! Whether you’re looking for an old-world Italian feel, or a polished French-Chateau look, adding a decorative faux finish to your walls provides a decadent touch.